“Thank you for visiting Scala Playhouse at the eroFame 2016! The eroFame presented the perfect stage to introduce visitors to all our latest releases and we couldn’t be happier with the positive response about our products, brands and amazing booth,” the company states. 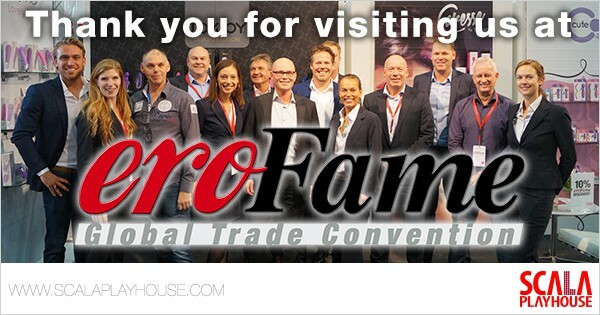 During the eroFame 2016 from the 5th to the 7th of October in Hannover, Germany, Scala Playhouse welcomed visitors to its biggest eroFame booth to date. Filled with all the latest releases, visitors were introduced to everything Scala Playhouse has to offer. “We are thrilled with all the compliments we received about our newest TOYJOY brand extensions LADOU by TOYJOY and LIL’BERRIES by TOYJOY. With orders coming in fast, these beautiful toys will soon find their way to consumers’ bedrooms and we are confident will be just as excited about all the innovative, thrilling functions as we are,” the company adds. Visitors to the Scala Playhouse eroFame booth also got the opportunity to browse the latest releases by Scala’s third-party brands and were assisted by the Scala Playhouse sales team.